I’ve spent the last two months on placement in Special Collections, following the closure of my usual workplace in the Museum of the University of St Andrews (MUSA) for renovation and extension. One of my weekly tasks has been helping out in the archive team, rehousing, cleaning and flattening documents concerned with the University Senatus from the nineteenth century. 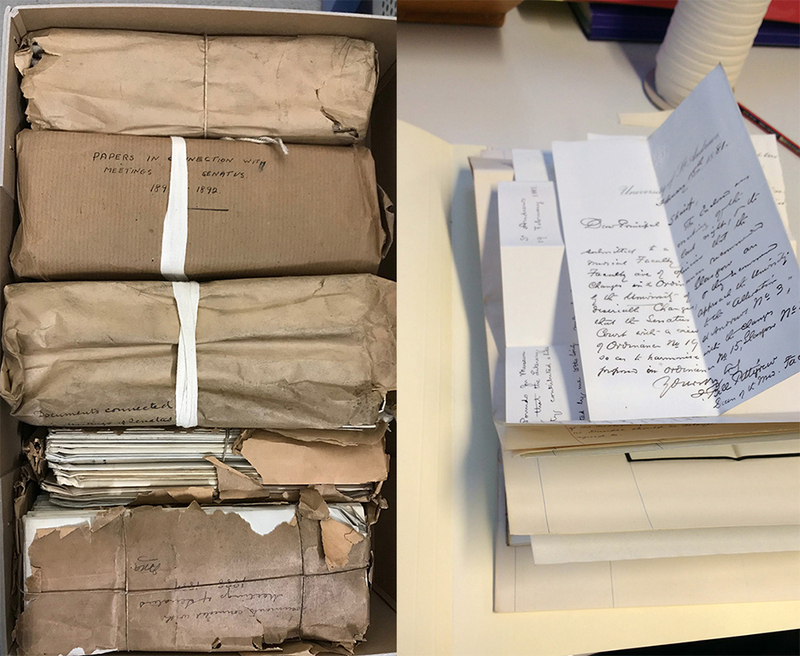 For decades, these papers have lain in tightly folded bundles, lovingly labelled by James Maitland Anderson, Librarian and Keeper of Muniments and Secretary to the University. They are wrapped in parcel paper and string, often blackened by over a century of dust and grime. My job was some light conservation and rehousing: I was to clean each document with a soot-sponge, replace any rusty staples with brass paperclips, flatten the paper out and arrange the documents into neat, ordered folders. Left: image of bundles before cleaning. Right: cleaned documents ready to be flattened and placed in folders. The process itself was fun: I had a workstation that looked like a fortress of paper, weights, brushes and sponges. Dabbing away huge patches of soot was very satisfying – particularly on documents that had been badly affected. The documents themselves can be best described as the equivalent of the email inbox of the University Senatus Academicus from the 1880s and 90s. I was amazed at how many day-to-day administrative documents have been kept: things that may seem of little value, but are now of historical worth in recording the university’s past – draft copies of letters sent, letters received from students, invitations to dinners, graduation programmes, scribbled notes in shorthand, petitions, applications for bursaries, and the minutes of every senate meeting. It made me wonder what of the present day’s documents that we consign to the recycling bin might be kept. What will an intern be organising from 2019 in centuries to come? 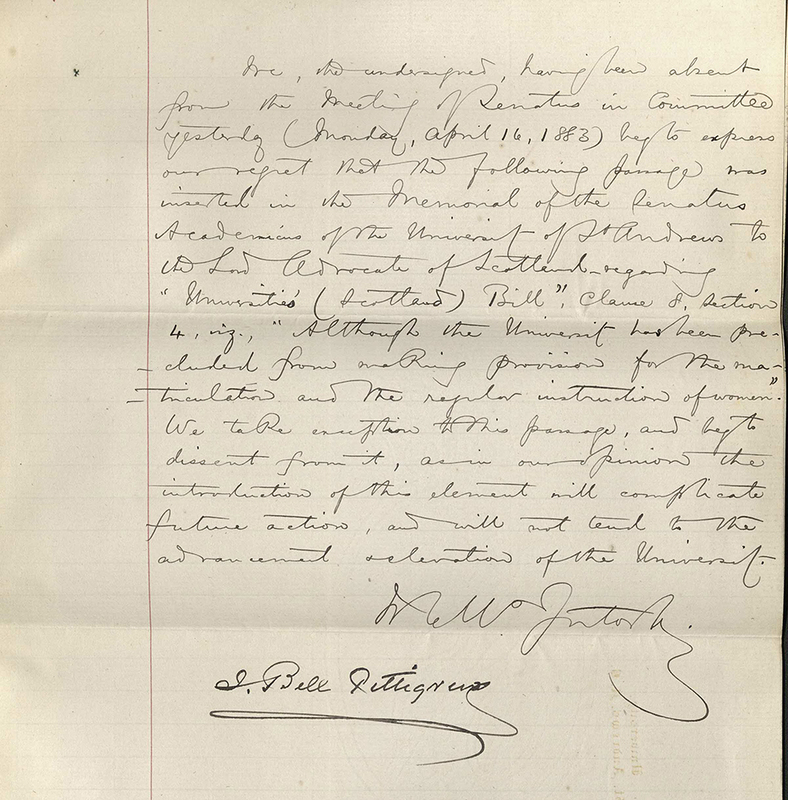 As most of the documents are hand-written in elaborate Victorian script, a lot of it I found hard to read. However, a few documents in particular stood out to me: because the handwriting was neater and I was able to read them, or they made me particularly curious, or because they contained names I recognised. One name that I knew immediately from my other work in Museum Collections was James Bell Pettigrew: the man that the Bell Pettigrew Museum commemorates. He was a member of the University Senate during the 1880s, and so his name crops up a lot. There were two particular occasions where his name appeared while I was sorting through these documents – memorable to me because they both concerned the admittance of women into the University of St Andrews. Until 1892, women could not take degrees at any Scottish University. From 1877 they were able to enrol in a distance-learning scheme called the Lady Literate in Arts (L.L.A. ), taking courses equivalent to degree standard but from which they earned only a diploma. 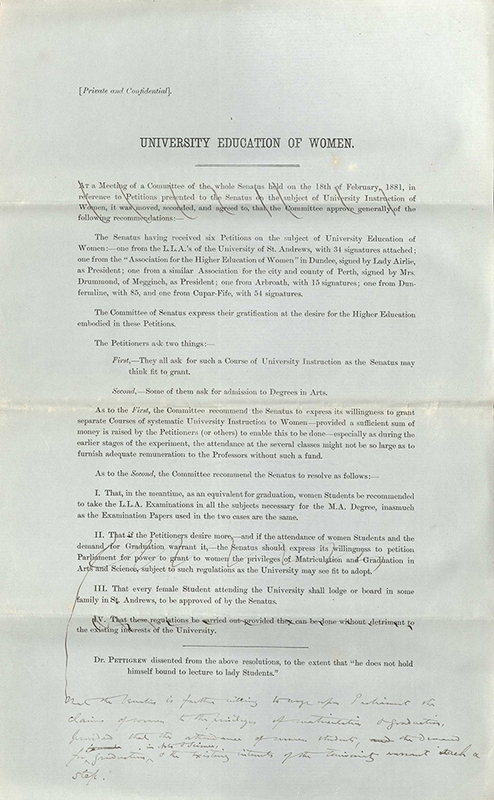 In 1881, a petition from women of Angus and Fife was delivered to the Senate to ask for more opportunities for women to study, and for them to be allowed to study full time. The senate discussed the matter and made some resolutions. In the footnote of this document, I noticed that Bell Pettigrew abstained from the decisions of the Senate, claiming that “he does not hold himself bound to lecture lady students”. A little later, I found a hand-written letter from 1883 formalising Bell Pettigrew’s (and his colleague William Carmichael McIntosh’s) dissent from the prospect of allowing women students to study full time in St Andrews. 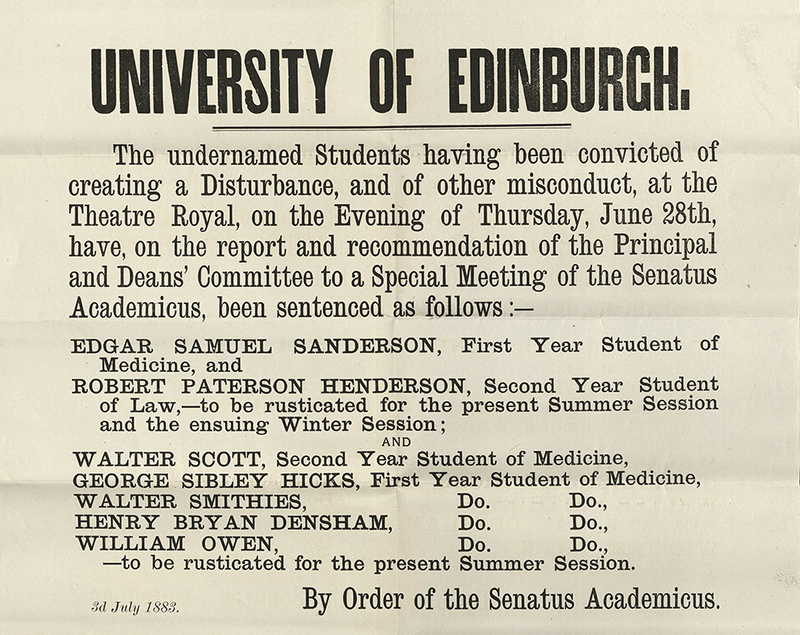 We, the undersigned, having been absent from the meeting of Senatus in Committee yesterday (Monday April 16, 1883) beg to express our regret that the following passage was inserted in the Memorial of the Senatus Academicus of the University of St Andrews to the Lord Advocate of Scotland, regarding the “Universities’ (Scotland) Bill”, Clause 8, Section 4, viz., “Although the university has been precluded from making provision for the matriculation and the regular instruction of women”. We take exception with this passage, and beg to dissent from it, as in our opinion the introduction of this element will complicate future actions and will not lend to the advancement and elevation of the University. As my colleague and I read it, we wondered, with a degree of relish, what Bell Pettigrew and McIntosh would have thought if they knew that two St Andrews educated (and now employed) women were handling and archiving this letter. It’s easy to forget, while becoming engrossed in the long history of the University, that women are relative newcomers to St Andrews and they had to fight such opposition in order to be able to study here and pave the way for new generations of women like myself to follow their path. There were subtle ways I was reminded – every letter to the senate was addressed to ‘Sirs’ or ‘Gentlemen’, and when referring to a group of students it was always ‘his degree’, ‘his conduct’. The only document that was written by a woman that I came across was a stark reminder of women’s dependency on her husband. A neat letter from a May Walker, told a sad story of a new widow running low on money. I will be obliged by you letting the University know the circumstances in which I am placed. 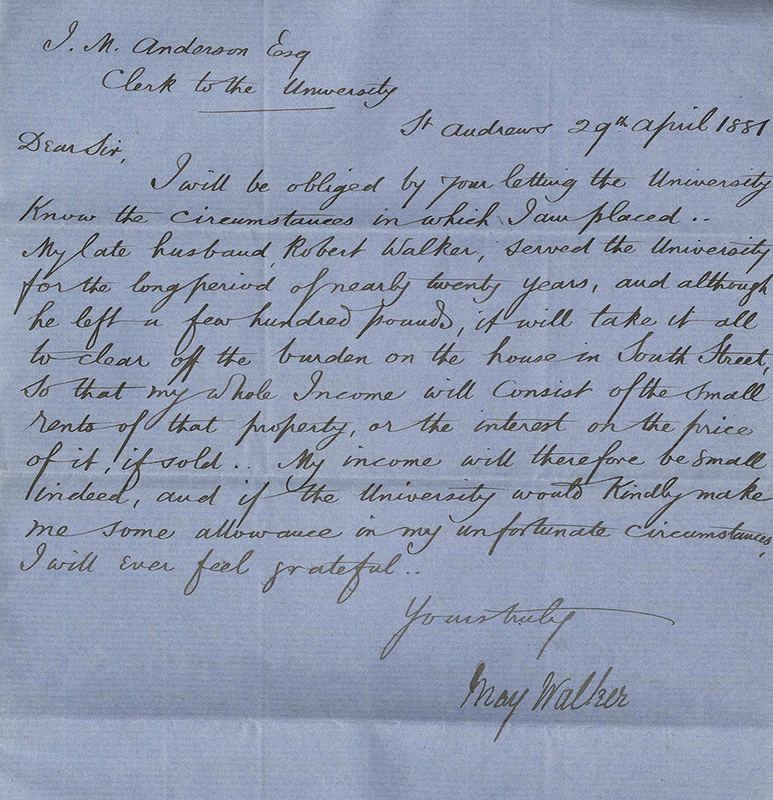 My late husband, Robert Walker, served the University for the long period of nearly twenty years, and although he left a few hundred pounds, it will take it all to clean off the burden on the house in South Street, so that my whole income will consist of the small rents of that property, or the interest on the price of it, if sold. My income will therefore be small indeed, and if the University would kindly make me some allowance in my unfortunate circumstances, I will ever feel grateful. May Walker was the wife of Robert Walker, who had served as University Librarian, Quaestor and Registrar and was also at one time curator of the University Museum. I felt keenly sympathetic towards May Walker, as I held her hand-written note, and hoped that the Senate were able to spare her something. I feel so grateful that as a woman born in the twentieth century, I have plenty of opportunities to earn my own money. There is something about handling these documents that made me feel particularly connected to the past, to the history of my university and the people who used to live, work and study in this little town. Another document that intrigued me was of a very different nature – and from a different university. It struck me as if it was a ‘Wanted’ poster the moment I unfolded it. I immediately wanted to know the story behind this and what exactly the ominously capitalised ‘Disturbance’ entailed. Luckily, because of wealth of items in Special Collections, my colleague and I were able to do a little further digging. In the newspaper holdings, we found a copy of the St Andrews Citizen from July 1883 to see if the Edinburgh story had broken as news over in Fife. Indeed it had, and we were able to ascertain that the ‘other misconduct’ must have been assault, as a few of the young men were faced with such charges. Although we weren’t able to get the full story of what happened in the Theatre Royal and all its dramatic details, I was so excited to have the means to dig deeper right at my fingertips. It spoke to my inner-researcher whom I thought I had to leave behind when I left university, and it gave me an insight into what a wonderful resource Special Collections is for researchers. When I described to a friend that I was filing the University Senate’s miscellaneous documents, they told me that sounded boring. By writing this blog post, I want to prove to anyone that shares that opinion just how alive and interesting even the most “boring” of documents can be if you just look. There are stories to be had everywhere, even this small portion of the University’s muniment collection. A footnote to women being accepted as students: I was an Arts student in St Andrews between 1959 and 1963. One of our English lecturers (all were male) used to hand back the male students’ essays individually. However the women students’ essays were flung down on the desk in front of the podium for us to pick up with the words ‘There are the rest’. How I do concur with Monica. There is a certain smug satisfaction in demonstrating the richness of a source that the rest of the world would think of no value. I found the Papers of the Secretary of the University, in the St Andrews Special Collections, immensely helpful and fertile. Well said! There is very little which is boring if you have an enquiring mind. As someone who once worked in Special Collections I am so glad you are enjoying your work there as much as I did. Another fascinating account of the treasures that are stored for future generations to pore over! Thank you all for your comments – how nice it is to hear from old friends of Special Collections and to know that the blog is keeping us in touch!